A handy find by folks at Cult of Mac that can give you a good idea of all that is running on your iPhone in the background is an app called Activity Monitor Touch which is basically a tiny port of the Mac version. The app displays tables and graphs for your device’s performance stats such as processor, memory usage, battery level and uptime as well as a list of running processes. You can even setup an alert by tapping the alarm icon besides the battery which goes off the moment your battery is fully charged. Unlike the desktop app, this doesn’t let you meddle with running apps directly. You can’t quit processes from the list of what’s running.
? 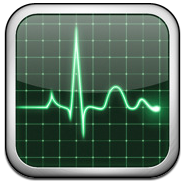 Just like Activity Monitor on your Mac, AMT is the most handy and pretty system monitor app in the App Store!
? Beautiful, useful, and universal. 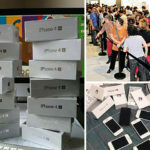 Buy it once and use it on your iPhone, iPod Touch, and iPad! – Overview page showing device UDID, capacity, free memory, battery power, and network state. 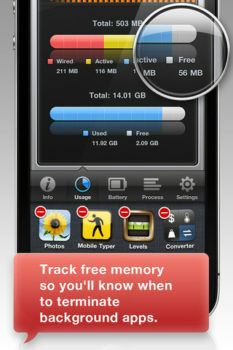 – Detailed usage information on memory. 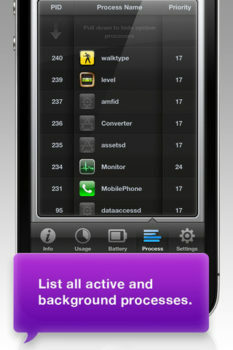 View free space and realtime CPU activity. – Battery state and remaining time for standby, gaming, surfing the net over WIFI / 3G, audio / video playback, and reading books. – Alert message & sound when battery is fully charged. You can download the free version of the app from here which only shows device overview and battery info or grab the full version for $2 from here.